The larger brother of the EcoGlow 20, the Brinsea EcoGlow 50 allows you to keep up to 50 chicks or ducklings warm after they have hatched. The EcoGlow 50 uses only 60 Watts compared to much more expensive infrared hanging bulbs and is far safer than using bulbs too. There's a 10 foot power lead which is thin enough to fit through the mesh on most coops and a transformer keeps the voltage down to 12V. 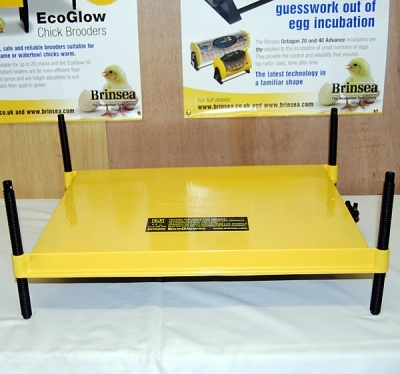 Adjustable legs mean you can keep chicks of all sizes and even have one end lower than the other!